New condition. The first of these rugs was woven in the 1980's. This is a very good condition example. The colors are simple and complimentary. The design is subtle but unmistakable. Wool: Good, dense, hand spun. Sheen: Very good Handle: Very sturdy example of the the floppy Baluchi rugs. Selvedge: Tightly and well wound shiny goat hair, braided. 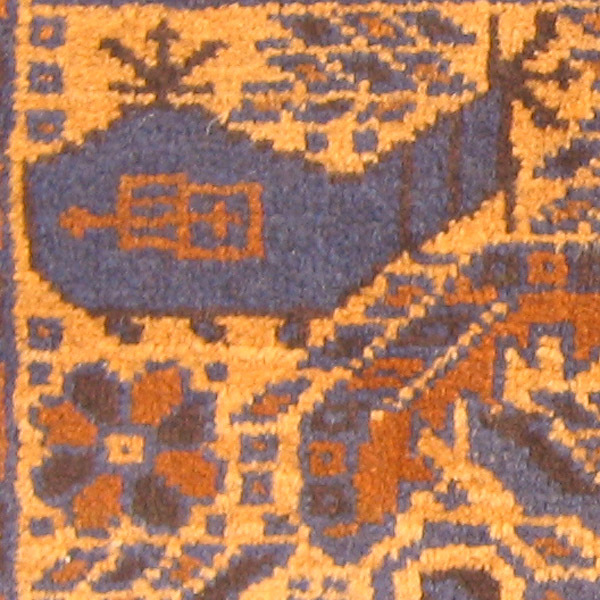 Fringe: Blue-tan-blue kilim, braided closure on top and overhand knots at the bottom. Pile: 7mm good wool. Warp: 2S1Z, buff wool with shoots of dark grey. Weft: Grey cotton.